Administrative Sales Assistant render support to the management and its team by assisting the sales department of the company, these Administrative Sales assistants normally perform various clerical duties like completing sales proposals, carrying out administrative tasks, coordinating meetings, office communications and so on. Typically these assistants need to assist the Sales Department by providing office support to the field representatives. 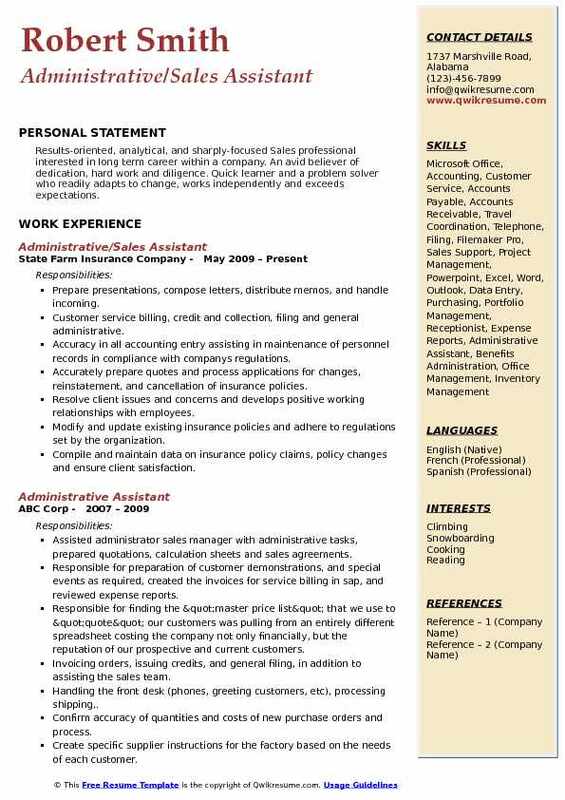 Administrative Sales Assistant Resume Sample which contains strong technological knowledge, organizational skill, and Sound judgmental capacity with good communicative skill will be regarded as the best resume for this job post. Although Employers seek a high school diploma for this position, it is preferable to have a Bachelors degree in Marketing, Sales or related field for making a good fortune as administrative sales Assistant. Objective : Driven and dedicated professional with a variety of successful experience in marketing, sales, project management, customer service and legal. Managed the ceos complex and frequently changing travel arrangements and coordinated the pre-planning of trips. Supplied sales and marketing support to a sales force of 9 sales reps. Managed external contacts for CEO and kept track of periodic communication needed for priority contacts. Conducted research to prepare, gather and proof briefing materials, agendas and decks for all. Directed administrative functions for the directors, principals, consultants and key managers. Distributed company-wide announcements, booked conference rooms and coordinated catering for annual. Located and attached appropriate files to incoming correspondence requiring replies. Coordinated dealer visitations, company special events and other employee morale functions. Organized and attended meetings, including compiling all documents and reports ahead of time. Objective : A challenging position as an administrative assistant at a growth-oriented firm, which will allow me to both further utilize my skills and acquire new abilities. Skills : Microsoft Office XP, QuickBooks, Adobe, Adobe Photoshop, Illustrator, Pagemaker, QuarkXpress, Type 60 Wpm with Complete Accuracy. Possess Knowledge In Illustration, Digital Photography, Typography, Layout And Pre-press. Performed administrative and secretarial functions - typed correspondence; faxes and maintained calendar. Help set up showroom for meetings and sat in on meetings with buyers. Handled 7 major accounts such as jcpenney, lane bryant, christopher & banks, cato, charming, ashley stewart and cache. Acted as a connection between accounts on one side and the production, designers and tech department on the other side. Provided all information for all parties either written, email or by phone. Handled all orders from a to z. Created cutting tickets for the orders and made sure that the orders were completed in due time. Arranged pc goods testing for jcpenney & christopher & banks as well as garment testing. Scheduled jcp inspections to be done in factories for all orders. Entered and maintained information for reports and provided information for everyone. Prepared the gcc forms for cpsia for each order for all accounts. In charge of sending fabric print, lab dips and trims samples to clients for approval. Also made sure client received appropriate samples they needed such as marketing, ecommerce, advertising samples and tops. Performed day-to-day administrative tasks such as maintaining information files and processing paperwork. Prepared reports (such as wip-work in process report, jcpenney production status report and sample request log), memos, letters, emails and other documents using word processing, spreadsheet, database and presentation software. Communicated with the factories in china, philippines, vietnam, indonesia and guatemala via email, phone and correspondences. Received information in regards to production of garments and shipping information of garments. Identified information by categorizing, estimating, recognizing difference or similarities and detecting changes in circumstance or events. Objective : I am currently looking to begin a career that allows me to expand on my interests in conservation and sustainability. I have a strong work history that includes 3+ years in various administrative roles, 5+ years in customer service, and multiples years in sales. Schedule weekly meetings and prepare agendas to ensure that all matters are addressed at each meeting. Assist in preparing travel arrangements for managers and department heads between company branches. Correspond with customers and confer with coworkers to answer inquiries and resolve account problems. Record and document security transactions, such as purchases, sales, and payments, using computers and certificate records. File, type, and operate standard office machines, such as pcs, copiers, fax machines, scanners, and telephones. Emphasize product features based on analyses of customers needs, and on technical knowledge of product capabilities and limitations. Inform customers of estimated delivery schedules, service contracts, or other information pertaining to products. Objective : Experienced and talented Executive Assistant offering years of experience in a highly demanding role. Demonstrated ability to handle high stress situations and provide quality results Excellent attention to detail Ability to deal with complex, confidential and sensitive situations. Demonstrated ability to organize, prioritize and multi-task Creative problem solving and decision-making skills Excellent customer service and troubleshooting skills. Provide administrative support to the coo, national service manager, and technical service department. Manage and maintain database for service reporting software (vektr), including initial setup of new users and locations. Design and supply various daily, monthly and quarterly service reports to appropriate managers to help achieve quality assurance standards. Provide troubleshooting support to staff and customers for vektr application. Provide supporting documentation to facilitate reconciliation of pos and invoices. Record and distribute minutes from weekly meetings and follow-up on agenda items as needed. Maintain crm database information for the great lakes and west regions. Analyze and supply reports from sage accounting system to sales staff and customers. 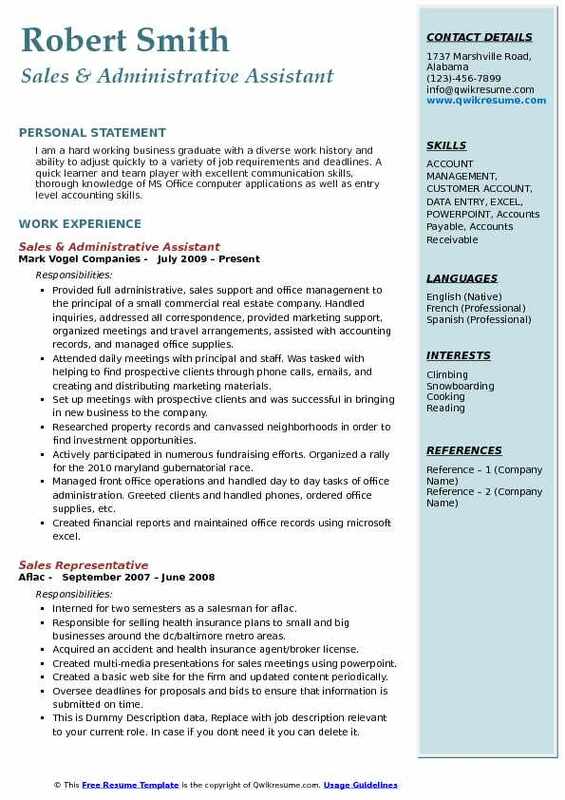 Summary : I am a hard working business graduate with a diverse work history and ability to adjust quickly to a variety of job requirements and deadlines. 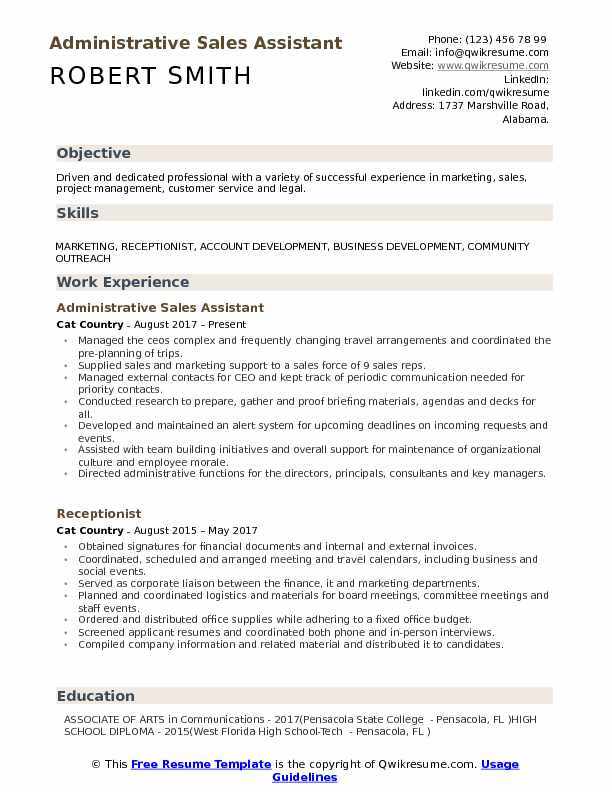 A quick learner and team player with excellent communication skills, thorough knowledge of MS Office computer applications as well as entry level accounting skills. Provided full administrative, sales support and office management to the principal of a small commercial real estate company. Handled inquiries, addressed all correspondence, provided marketing support, organized meetings and travel arrangements, assisted with accounting records, and managed office supplies. Attended daily meetings with principal and staff. Was tasked with helping to find prospective clients through phone calls, emails, and creating and distributing marketing materials. Set up meetings with prospective clients and was successful in bringing in new business to the company. Researched property records and canvassed neighborhoods in order to find investment opportunities. Actively participated in numerous fundraising efforts. Organized a rally for the 2010 maryland gubernatorial race. Managed front office operations and handled day to day tasks of office administration. Greeted clients and handled phones, ordered office supplies, etc. Created financial reports and maintained office records using microsoft excel. Other accounting duties included paying invoices and depositing checks. Summary : Meticulous Executive Assistant, excellent at juggling multiple tasks and working under pressure. Broad industry experience includes Healthcare, Customer Service, Finance and Legal. Entered and retrieved data to update records, reservations and address guests inquiries. Using marriott computer based programs (sfa web/ngs/pms/marsha/ebonus), ensured. As sme (subject matter expert) decreased hotels sfa web scorecard data verification. Queries approximately 85%-90% on weekly/period-end basis through "clean-up" process. Created "step by step cheat sheets" for sales/events associates to utilize, thus reducing. Provided and conducted mini-training sessions with new associates in computer-based. Programs and internal procedures, including the preparation of handouts for ready reference. Used internet for research purposes for historical data on groups, local information, etc. Answered telephone using appropriate etiquette and professional language. Used the "the. Buck stops here" approach, when appropriate, to assist callers concerns. Followed-up with caller as to findings from research of inquiry. Headline : Seeking an Administrative & Sales Assistant position with a teamwork-based company in order to utilize my technological, organizational, communication, and creative skills. Skills : Proficient In QuickBooks, MS Outlook, MS Word, MS Excel, MS PowerPoint, ACT! Manage the receptionist area, including greeting visitors/radio prize winners and respond to telephone and in-person requests for information. Assist sales agents in designing and creating appealing marketing tools to use when calling on current and potential clients. 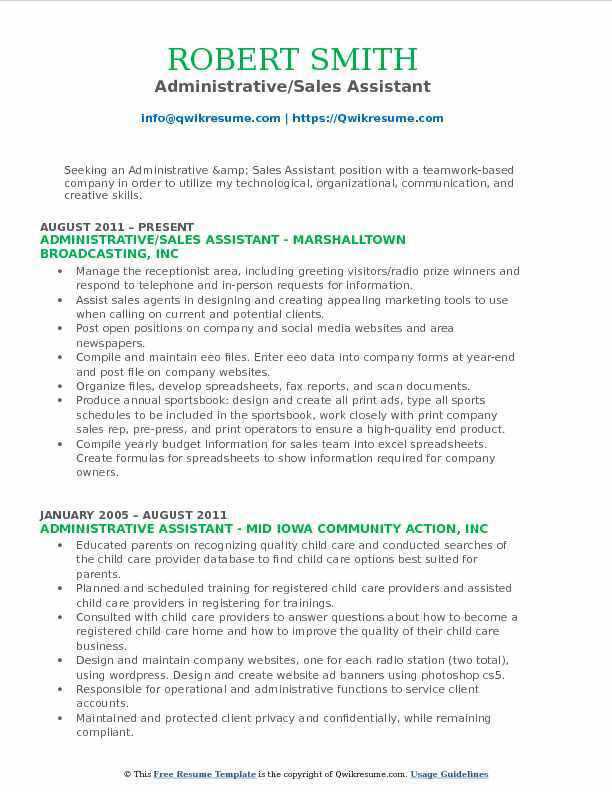 Post open positions on company and social media websites and area newspapers. Compile and maintain eeo files. Enter eeo data into company forms at year-end and post file on company websites. Organize files, develop spreadsheets, fax reports, and scan documents. Produce annual sportsbook: design and create all print ads, type all sports schedules to be included in the sportsbook, work closely with print company sales rep, pre-press, and print operators to ensure a high-quality end product. Compile yearly budget information for sales team into excel spreadsheets. Create formulas for spreadsheets to show information required for company owners. Prepare proposals and group sales contracts for sales managers in a timely manner. First point of contact for incoming phone leads in order to qualify and assign to the appropriate sales manager. 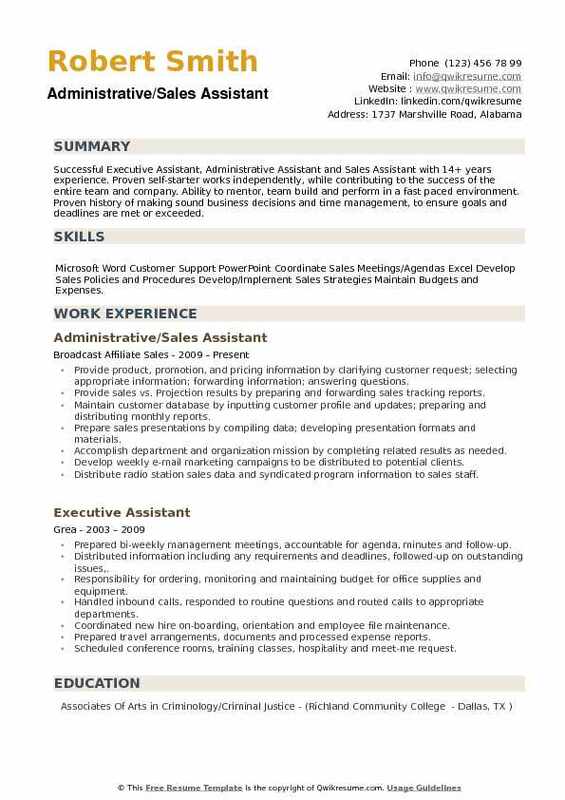 Objective : To obtain a customer service or administrative sales assistant position, with an opportunity for professional continuous growth were knowledge and skills can be utilized. Schedule, design, and oversee daily tasks, appointments, and events for the district manager and benefit consultants. Sort and manage lists of appointments for field and inside agents, and distribute them via excel spreadsheets and. Responsible for shipments and mail to and from the west tn district office. 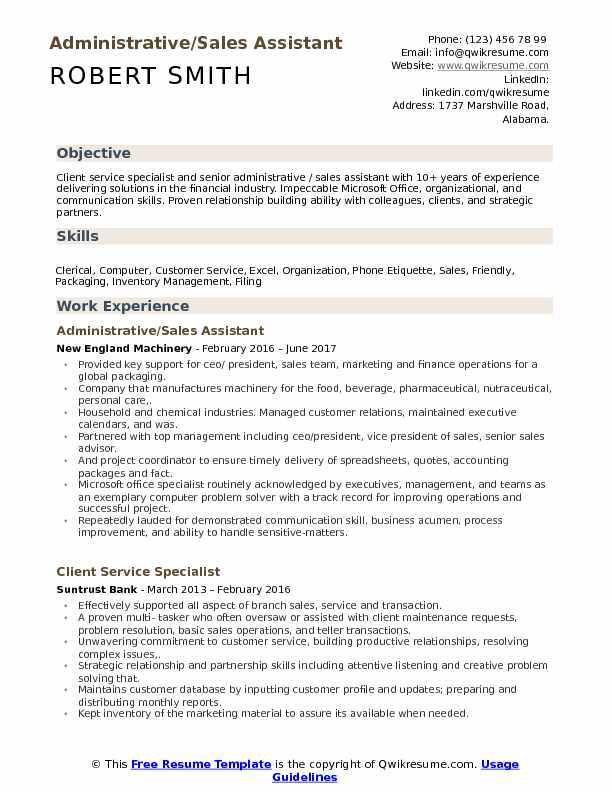 Proficient in multiple computer programs including microsoft excel, outlook, word, and powerpoint; alongside with. 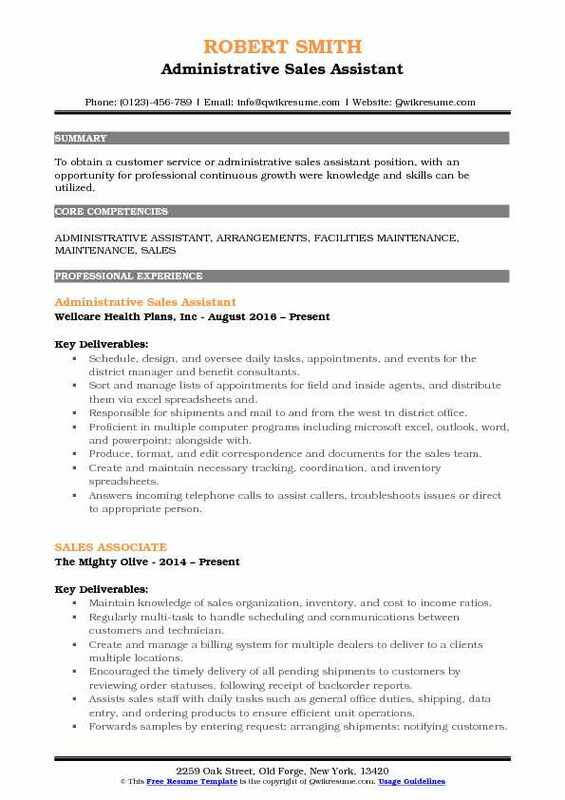 Produce, format, and edit correspondence and documents for the sales team. Create and maintain necessary tracking, coordination, and inventory spreadsheets. Answers incoming telephone calls to assist callers, troubleshoots issues or direct to appropriate person. Provides administrative services such as ordering business cards, printing labels, developing and printing flyers etc. To the sales team. Summary : Results-oriented, analytical, and sharply-focused Sales professional interested in long term career within a company. An avid believer of dedication, hard work and diligence. Quick learner and a problem solver who readily adapts to change, works independently and exceeds expectations. Prepare presentations, compose letters, distribute memos, and handle incoming. Customer service billing, credit and collection, filing and general administrative. Accuracy in all accounting entry assisting in maintenance of personnel records in compliance with companys regulations. Accurately prepare quotes and process applications for changes, reinstatement, and cancellation of insurance policies. Resolve client issues and concerns and develops positive working relationships with employees. Modify and update existing insurance policies and adhere to regulations set by the organization. Compile and maintain data on insurance policy claims, policy changes and ensure client satisfaction. Work closely with other administrative staff and assist an executive with miscellaneous duties as needed. Research and development for various aspects of the company including point of sale systems, digitizing files, marketing, and improving customer relations through follow-up phone calls and emails, social media, a customer feedback program, and taking the time to listen and determine the customers needs. 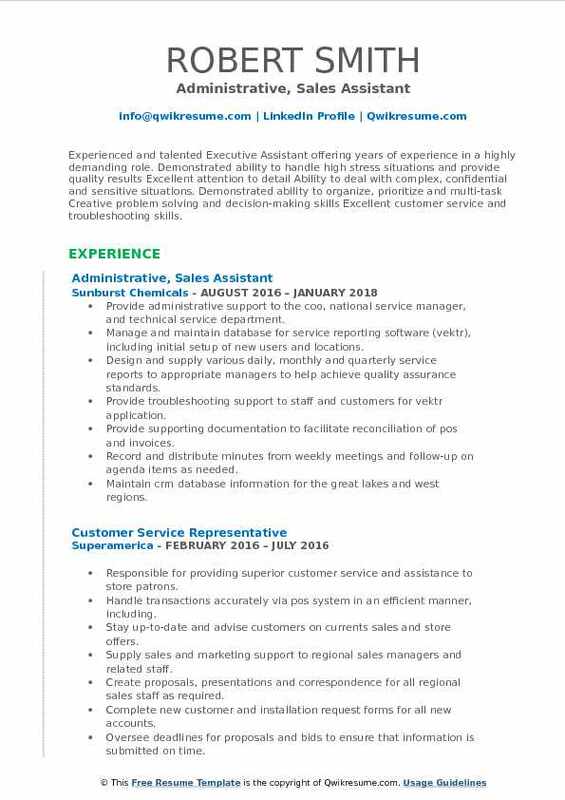 Summary : Successful Executive Assistant, Administrative Assistant and Sales Assistant with 14+ years experience. Proven self-starter works independently, while contributing to the success of the entire team and company. Ability to mentor, team build and perform in a fast paced environment. Proven history of making sound business decisions and time management, to ensure goals and deadlines are met or exceeded. 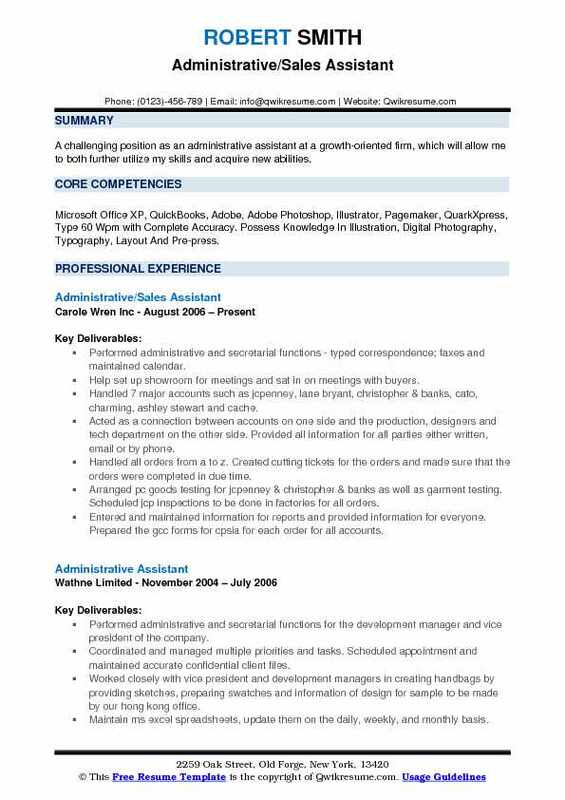 Skills : Microsoft Word Customer Support PowerPoint Coordinate Sales Meetings/Agendas Excel Develop Sales Policies and Procedures Develop/Implement Sales Strategies Maintain Budgets and Expenses. Provide product, promotion, and pricing information by clarifying customer request; selecting appropriate information; forwarding information; answering questions. Provide sales vs. Projection results by preparing and forwarding sales tracking reports. Maintain customer database by inputting customer profile and updates; preparing and distributing monthly reports. Prepare sales presentations by compiling data; developing presentation formats and materials. Accomplish department and organization mission by completing related results as needed. Develop weekly e-mail marketing campaigns to be distributed to potential clients. Distribute radio station sales data and syndicated program information to sales staff. Produce sales material and technical information for new syndicated programs. Headline : Client service specialist and senior administrative / sales assistant with 10+ years of experience delivering solutions in the financial industry. 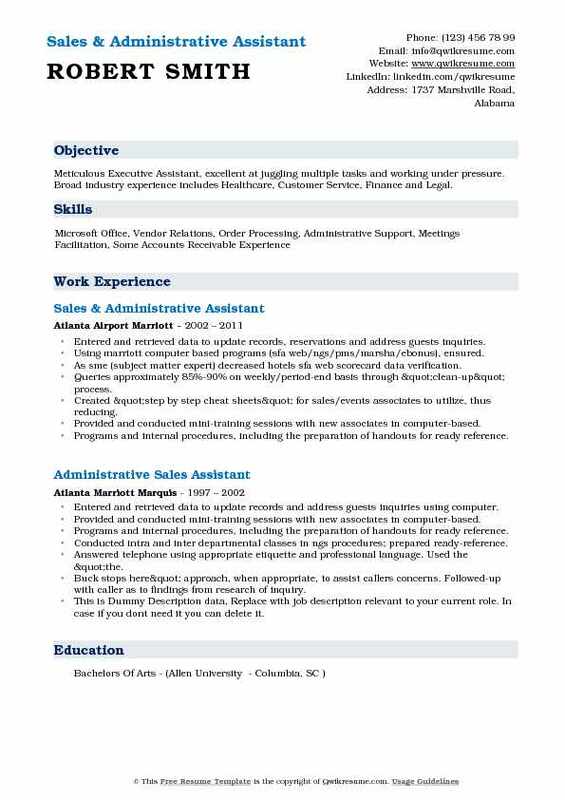 Impeccable Microsoft Office, organizational, and communication skills. Proven relationship building ability with colleagues, clients, and strategic partners. Provided key support for ceo/ president, sales team, marketing and finance operations for a global packaging. Company that manufactures machinery for the food, beverage, pharmaceutical, nutraceutical, personal care,. Household and chemical industries. Managed customer relations, maintained executive calendars, and was. Partnered with top management including ceo/president, vice president of sales, senior sales advisor. And project coordinator to ensure timely delivery of spreadsheets, quotes, accounting packages and fact. 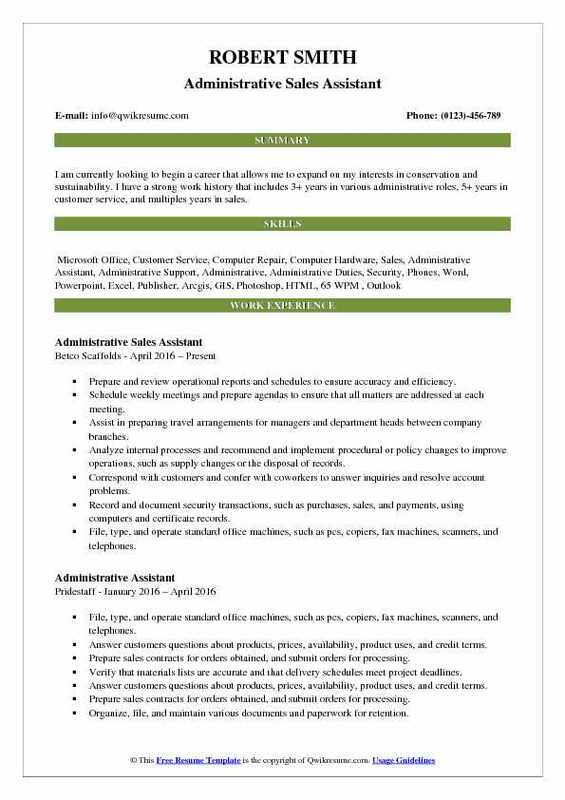 Microsoft office specialist routinely acknowledged by executives, management, and teams as an exemplary computer problem solver with a track record for improving operations and successful project. Repeatedly lauded for demonstrated communication skill, business acumen, process improvement, and ability to handle sensitive-matters. Coordinated executive - level domestic and international travel. Negotiated hotel and car rental discounts.